Today, we are reporting that over the past five years IBM has been removing older U.S. employees from their jobs, replacing some with younger, less experienced, lower-paid American workers and moving many other jobs overseas. We don’t know the exact size of the problem. Our questionnaire isn’t a scientific sample, nor did all the participants tell us they experienced age discrimination. But the hundreds of similar stories show a pattern of older employees being pushed out even when the company itself says they were doing a good job. We know readers will wonder how we sourced some pretty serious claims. Many ex-employees trusted us with their stories and spent many hours in conversation with us. We think it’s good practice to let them know how we’ve used their information. This is the probably the first time we’ve been pointed to a big project by a community of people we found through digital outreach. We hope that by sharing our experiences, we can help others build on our work. A screenshot of the labels on our original age discrimination questionnaire, where we track themes and try to pull out patterns. Dozens of people responded within the first couple of weeks. As we looked through this first round of questionnaires, we noticed a theme: a whole lot of information and technology workers told us they were struggling to stay employed. And those who had lost their jobs? They were having a really hard time finding new work. We started making some calls. 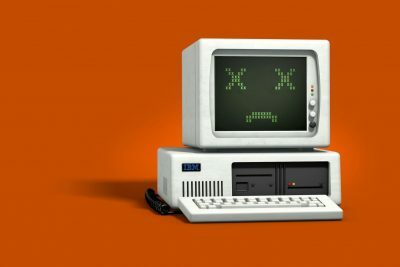 One of the first people we talked to was Brian Paulson, a 57-year-old senior manager with 18 years at IBM, who was fired for “performance reasons” that the company refused to explain. He was still job-hunting two years later. Former IBM workers were already comparing notes on Facebook, Reddit, LinkedIn and elsewhere. 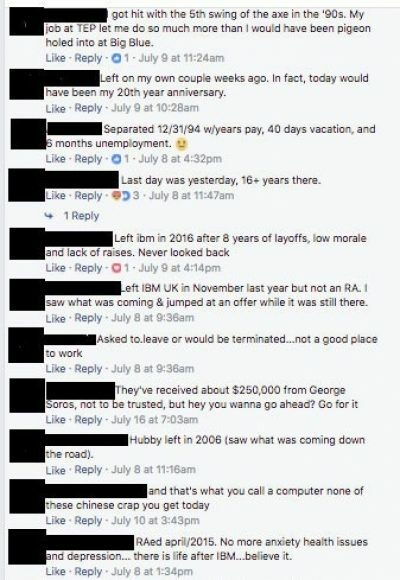 Another ex-IBM employee told us that she had seen examples of older workers laid off from many parts of the company on a public Facebook page called WatchingIBM. 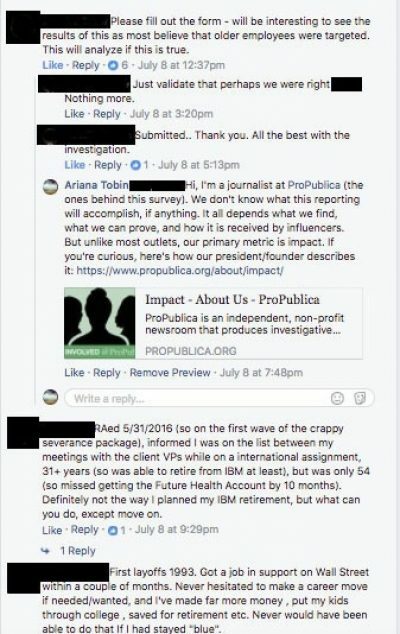 Ariana spent a day looking through the posts, which were, as promised, crawling with stories, questions, and calls for support from workers of all kinds, as shown in the accompanying screenshot. We decided to reach out to the page’s administrator, who was a longtime IBM workplace activist, Lee Conrad. He shared our age discrimination questionnaire in the group and more responses poured in. We realized that we had been pointed toward an angry, sad and motivated group. The older ex-IBM workers we called were trying to figure out whether their own layoffs were unique or part of a larger trend. And if they were part of a larger trend … how many people were affected? A major frustration we saw in comment after comment: These workers couldn’t get information on how many others had been forced out with them. This was an information gap that immediately struck Peter, because that information is exactly what the law requires employers to disclose at the time of a layoff. On top of that, many of these sources mentioned having been forced to sign agreements that kept them from going to court or even talking about what had happened to them. 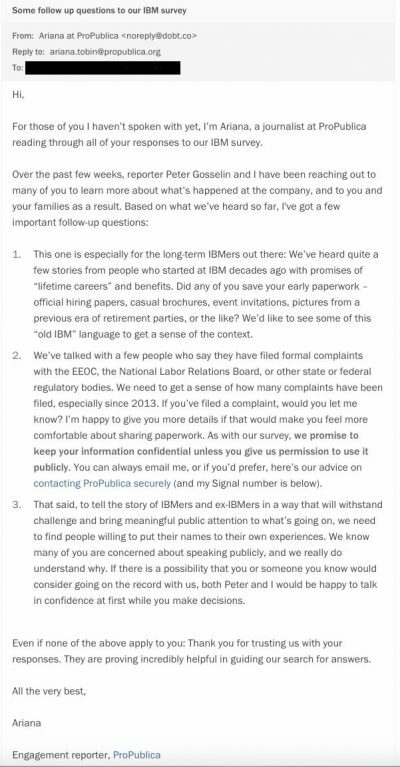 They were scared to do anything in violation of those agreements, a fear that kept them from finding out the answers to some big open questions: Why would IBM have stopped releasing the ages and positions of those let go, as they had done before 2014 to comply with federal law? How many workers out there believed they had been “retired” against their will? What did managers really tell their subordinates when the time came to let them go? Who was left to do all of their work? So we wrote up another questionnaire asking those specific questions. 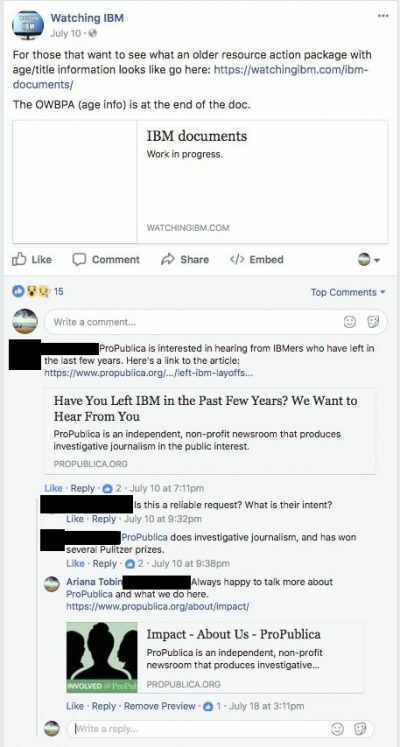 We contacted people on listservs, found them on open petitions, joined closed LinkedIn networks, and followed each posting on ex-IBM groups. We tweeted the questionnaire out on days that IBM reported its earnings, including the company’s ticker symbol. We talked to trade magazines and IBM historians and organizers who still work at IBM. We bought ads on Facebook and aimed them toward cities and towns where we knew IBM had been cutting its workforce. As the responses came in, we tried to figure out where most of them were coming from. To identify any meaningful trends, we needed to know who was answering, what was working, and why. We also realized that we needed to introduce ourselves in order to persuade anyone it was worth participating. The biggest spikes in response came when community members shared the questionnaire themselves. Plenty of people were skeptical of us. We tried to be responsive. A snapshot of pageviews on our questionnaire in August. It suggests that most came from Facebook, and the next most came from direct shares, such as email or chat. We explicitly asked people who participated in our questionnaire to recruit their former coworkers. We read through all of the responses and identified themes: 183 respondents said the company recorded them as having retired by choice even though they had no desire to retire or flat-out objected to the idea. Forty-five people were told they’d have to uproot their lives and move sometimes thousands of miles from the communities where they had worked for years, or else resign. Fifty-three said their jobs had been moved overseas. Some were happy they’d left. Some were company luminaries, given top ratings throughout their career. Some were still fighting over benefits and health care. Some were worried about finding work ever again. The ever-changing list of labels on our IBM questionnaire. Inevitably, this categorization process led to us to identify new patterns as we went along, and as new responses accumulated. For each new pattern, we would go back and see how many people fit. One of the first and most interesting such categories were the people who had received emails congratulating them on their retirement at the same time as they were informed of their layoff. We realized there would be power in numbers there, so we set up a SecureDrop for people who were willing to send us their paperwork. Eventually, we also created a category called “legal action.” We’d stumbled upon support groups of ex-IBM employees who had filed formal complaints with the Equal Employment Opportunity Commission. Some sent us the company’s responses to their individual complaints, giving us insight into the way the company responded to allegations of discrimination. These seemed, of course, very useful. IBM undoubtedly has information that would shed light on the documents, its layoff practices or the overall extent and nature of its job cuts. The company chose not to respond to our questions about those issues. So we tried to answer ex-IBMers’ questions ourselves, including one of the most basic: How many employees ages 40 and over were let go or left in recent years? IBM won’t say. In fact, over the years, the company has stopped releasing almost all information about its U.S. workforce. In 2009, it stopped publishing its American employment total. In 2014, it stopped disclosing the numbers and ages of older employees it was laying off, a requirement of the nation’s basic anti-age bias law, the Age Discrimination in Employment Act (ADEA). So we’ve sought to estimate the number, relying on one of the few remaining bits of company-provided information — a technique developed by a veteran financial analyst who follows IBM for investors — as well as patterns we spotted in internal company documents. We began with a line in the company’s quarterly and annual filings with the U.S. Securities and Exchange Commission for “workforce rebalancing,” a company term for layoffs, firings and other non-retirement departures. It’s a gauge of what IBM spends to let people go. In the past five years, workforce rebalancing charges have totaled $4.3 billion. The technique was used by veteran IBM analyst Toni Sacconaghi of Bernstein Research. Sacconaghi is a respected Wall Street analyst who has been named to Institutional Investor’s All-America Research Team every year since 2001. His technique and layoff estimates have been widely cited by news organizations including The Wall Street Journal and Fortune. Some years ago, Sacconaghi estimated that IBM’s average per-employee cost for laying off a worker was $70,000. Dividing $4.3 billion by $70,000 suggests that during the past five years IBM’s worldwide job cuts totaled about 62,000. If anything, that number is low, given IBM executives’ comments at a recent investor conference. Internal company documents we reviewed suggest that 50 to 60 percent of cuts were made in the U.S., with older workers representing roughly 60 percent of those. That translates to about 20,000 older American workers let go. Our analysis suggests the total of U.S. layoffs is almost certainly higher. First, as Sacconaghi said in a recent interview, IBM’s per-employee rebalancing costs are likely much lower now because, starting in 2016, the company reduced severance payments to departing employees from six months to just 30 days. That means IBM can lay off or fire more people for the same or lower overall costs. 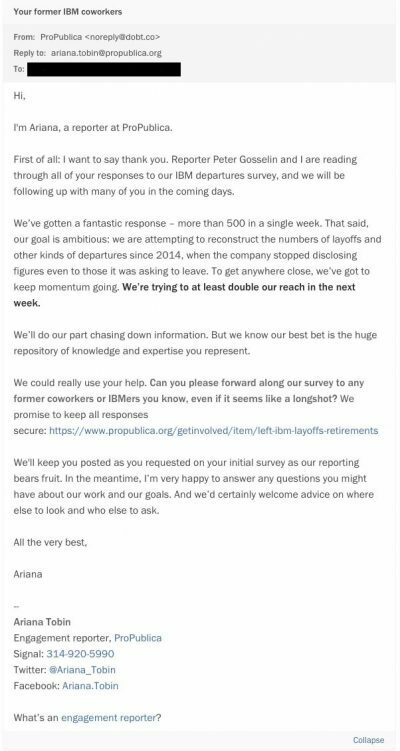 Second, because, as those ex-IBMers told us, the company often converts their layoffs into retirements, the workplace rebalancing numbers don’t tell the whole story. Right below the line for “workforce rebalancing” in its SEC filings, IBM adds another line for “retirement-related costs,” which reflects how much the company spends each year retiring people out. Some — perhaps a substantial amount of that — went to retirements that were less than fully voluntary. This could add up to thousands more people. Many of the conversations we’ve had during our reporting didn’t make it into the final story. People allowed us to review internal company documents. They let us see long email exchanges with their managers. They dug back through closets and garages to find memos they had saved out of frustration or fatigue or just plain anger. We can’t go into detail about all of the ways the community helped us report out this story, because we also promised many of our sources that we would protect their confidentiality. The beauty is that they talked to us anyway. They knew where to find us, because our contact information had been spread far and wide. So for any more ex-IBMers out there? We’d still love to hear from you. Please be in touch. Ryann Grochowski-Jones, Mike Tigas, Derek Kravitz and Jeremy Merrill contributed reporting. Special thanks also to independent technology reporter Ethan Chiel and analyst Michael Ferrer.